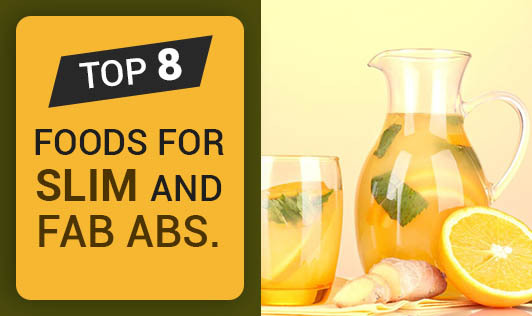 Top 8 Foods For Slim and Fab Abs. 1. Almonds: These yummy, versatile nuts are filled with proteins, fibre, and a very powerful antioxidant, vitamin E. It is a magnesium rich food that helps in maintaining muscle tissue and also regulates blood sugar levels. They also help to curb cravings that can prevent overeating and hence weight gain. Studies suggest that the cell walls of these nuts prevent absorption of fats in them. So you can include these lean fat nuts! Include: 6 almonds daily as a power snack. 3. Soy: It is a great source of vegetable protein rich in antioxidants and fiber. Studies from the ‘American College of Nutrition' shows that overweight people who include soy milk and milk products daily in their diet tend to lose weight faster. Include:25 grams of whole soy or 50 grams of tofu in your diet daily. 4. Apples: Apples contain a magic compound called ‘quercitin' which helps fight cancer, keep lungs healthy and reduce the damage caused by increased cholesterol levels. A large apple has 85% water and 5gms of fiber which keeps you full for longer. Include: One to two apples daily. 5. Berries: Berries are best friends for every dieter as it is loaded with fiber. It is suggested that 25-35 grams of fiber is ideal to reduce calorie absorption from all the wrong foods you may have eaten.Include: A minimum of half cup (50gm) of berries is worth it. Go for mixed berries instead of a single variety for great taste and excitement! 6. Green Leafy vegetables: These carotenoids rich leaves won't help you to reduce your waist line, but its low calorie count will. They are a very good source of calcium and hence a very essential mineral required for muscle contraction, which means it will pep up your workouts. Include: A bunch of your favorite green leafy vegetable in soups, salads, gravies, stir fries or even sandwiches. 7. Yogurt: The probiotic bacteria in yogurt can keep your digestive system healthy by lowering the incidence of gas, bloating and constipation which make your tummy look flat. Include: Two cups of fat-free or low fat and unsweetened yogurt. Add a handful of fresh cut fruit of your choice to enhance its flavor and get that extra fibre. 8. Vegetable soup: People who include two bowls of soup daily, lose weight successfully when compared to people who indulge in a snack of the same amount of calories. It is also one of the healthy ways to get the vegetables in. Include: A minimum of one bowl of vegetable soup every day. So, now you know what to eat for that slim and fab ab. Ask your dietitian to help you plan the perfect diet for you. So what are you waiting for? Go for it!